Warning: this entry features tales of mass-murder by neglect and ravenous rodents and scenes of decomposition. Posts by fellow bloggers Gayla and Rach have inspired me to get around to re-stocking the wormery that I bought in England four or five years ago. This gadget has had a rather chequered history. My first batch of worms tried their hardest to escape and had to be collected regularly from the floor of the garage and returned to their new home. They must have had forebodings of the dreadful calamity that befell them a few months later, when the tap on the base of the wormery got blocked and the worms, which had all fallen through to the lower section, drowned in their own nutritious 'worm tea'. I kept the wormery outside for the second batch and it worked better - I covered the bottom of the lowest layer with some carpet to stop the worms falling through into the base and covered the tap to stop it from getting blocked again. All went well and the worms did their thing, producing lovely vermicompost and worm tea for the garden. 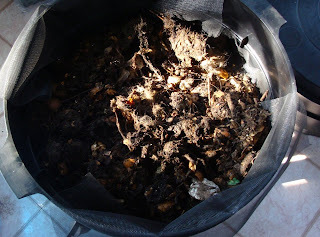 So, with my vermicultural credentials established, I ordered more worms to go into my garden compost bin. That worked well too, until one day I noticed that all the worms had gone. Then I started to find rat-droppings near the compost bin and realised that we had a new resident. I'll never forget the piercing squeal that the rat gave when we evicted it (Mike thought it was me screaming at the sight of the rat. I still haven't quite forgiven him for thinking that.). Chicken wire underneath the compost bin stopped the rat coming back. I couldn't bring the surviving worms with me when we moved to Canada, as customs officials are a bit fussy about soil crossing international boundaries. I had to thoroughly disinfect the wormery (and all my garden tools) so that there was no trace of English earth on anything. I stank of Jeyes Fluid for a week after that! Since we got to Canada the wormery has been sitting empty in the garage, so it was about time that I did something about it. 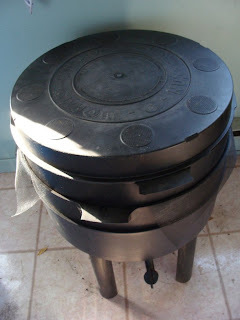 The Can-O-Worms wormery comes with three layers for the worms to live in. You start off using just two: in the bottom layer goes bedding material for the worms. This time I've put a lining of fly-screen netting over the bottom of this layer to stop the worms falling into the base, which is where the moisture collects. On top of the netting is partially-composted kitchen waste from the rotating composter that's out in the garden (which we've finally got the hang of - it needs a lot more water than a regular compost bin). Then the half-pound of worms went in with the shredded paper and soil that they had arrived in. I only ordered them two days before: I still think it's a bit strange that you can send live worms through the post. The next layer went on top, ready to be filled with green kitchen waste. 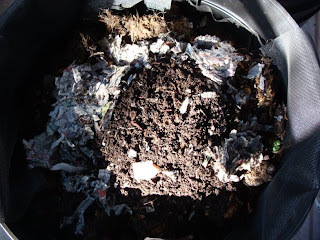 As the worms finish up the food in the lower layer, they'll move up to feast on the gently rotting waste in this layer. 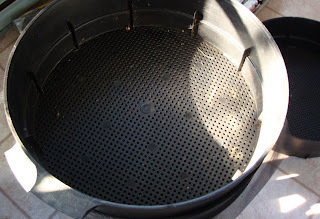 As that gets filled, you can add the final layer and eventually use the compost in the bottom layer, which the worms will have left and which will be fully decomposed and wonderful for the garden.